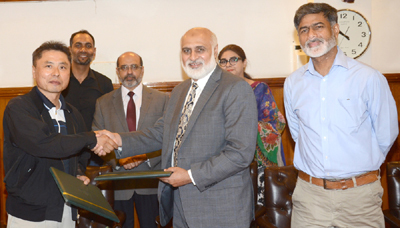 LAHORE: (Monday, July 9, 2018): Punjab University Centre for Integrated Mountain Research and Climate Research Institute, Konkuk University Seoul, South Korea have signed a memorandum of understanding to launch joint ventures in the fields of agriculture, ecology, forestry, climate change and their impacts on crops particularly to food security perspective. In this regard, an MoU signing ceremony was organized at Vice Chancellor’s office here on Monday. 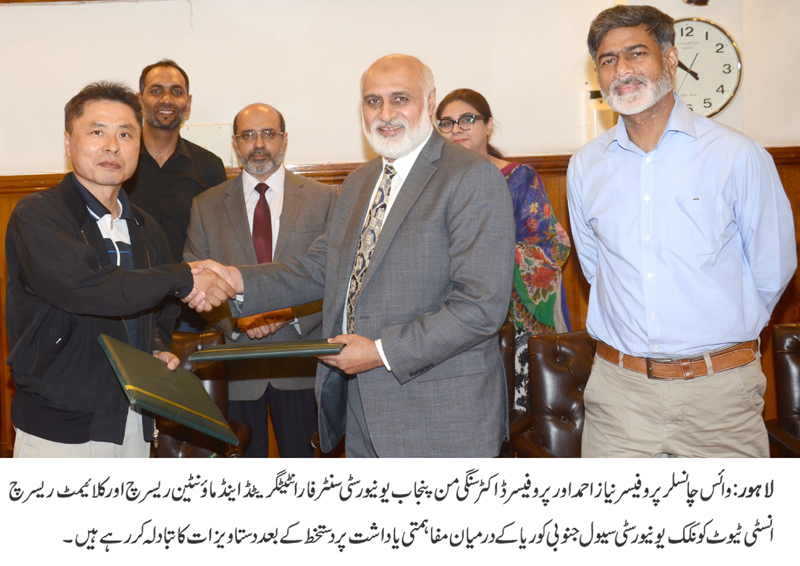 PU Vice Chancellor Prof Niaz Ahmed, Konkuk University President Prof Dr Sanggi Min, Climate Research Institute Director Prof Dr Seungho Lee, CIMR Director Dr Safdar Ali Shirazi, PU Registrar Dr Muhammad Khalid Khan, Director External Linkages Dr Fauzia Hadi Ali and others were present on the occasion. Both the universities have agreed to exchange faculty members, students, staff, publications, relevant scholarly information and launch joint research projects, lectures and symposia. Addressing the ceremony, Prof Niaz Ahmed said that PU would collaborate with international universities and organizations for promotion of quality research in all the fields. He stressed the need to enhance collaboration with the academic and research institutions of both the countries.